FLIR offers the Duo Pro R high-resolution thermal and visible light imager specifically designed for commercial, industrial, and public safety applications. This HD camera features a dual-sensor with high-definition 4K color and thermal video recording in a single package. 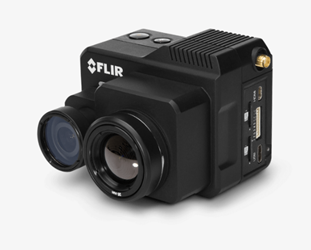 The FLIR Duo™ Pro R can geo-tag each captured image, eliminating the complexity, data loss, and latency that can rise from integrating to external flight control systems. The multiple thermal resolution and lens options deliver flexible, powerful camera control and optimal configuration. Additional features include a wide 5 – 26 VDC power input range, MSX blending for greater image detail in daylight conditions, and live analog or digital video output options. Download the above datasheet, or check out the video below for more information on the FLIR Duo™ Pro R imager.